The readings for the Sunday Liturgy recently included passages from Ezekiel, St. Paul’s Second Letter to the Corinthians, and the Gospel of St. Mark. Ezekiel is sent by God to proclaim to the “impudent and stubborn” Israelites that he is their faithful God, and to repent and return to Him. Say to them God tells his prophet: “Thus says the Lord, God. And whether they hear or refuse to hear (for they are a rebellious house) they will know that there has been a prophet among them” — Ezekiel 2: 4-5. Paul tells the Corinthians that he has “three times” begged God to relieve him of a”thorn given to me in the flesh,” an affliction that he calls “a messenger of Satan.” The Lord’s answer he tells us was this: “My grace is sufficient for you, for my power is made perfect in weakness.” Paul’s answer was that he is “content with weaknesses, insults, hardships, persecutions, and calamities; for when I am weak, then I am strong” 2 Corinthians 12:7-10. In the Gospel mark recounts a visit by Jesus to his “own country” where he preached in the synagogue. But his neighbors would not see him as anyone by a local guy, one of them, and resented his wisdom and knowledge presented to them in his preaching. A prophet is without glory in his own land, Jesus told his neighbors that day in the synagogue. “He marveled because of their unbelief.” Their lack of faith and narrowness was so great that “he could do no mighty work there, except that he laid his hands upon a few sick people and healed them” — Mark 6: 1-6. There is a big message here for those in the pro-life apostolate. 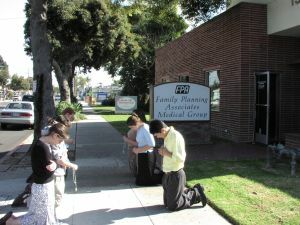 At the local abortuary we are in our “own country,” the abortion seekers and abortion providers are our fellow citizens, frequently our fellow Christians, and sometimes even our fellow Catholics. We are there to save lives and souls, to condemn the act, but love the person. To offer the trust about life, and do so with charity, including the offer of material and emotional support. But how often we have marveled because of their unbelief.” How hard it is to do the “mighty work” of saving a child marked for death and the child’s mother marked for a lifetime of pain for the killing of an innocent child. How difficult it is to continue in the face of the attacks from the abortionists and their followers, full of resentment that anyone in this their “own country” would dare to speak wisdom and truth to them. St. Pau does not describe the “thorn in the flesh” that so afflicted him that he begged the Lord “three times” to take it away. But we all have thorns in the flesh, individually and in our efforts to evangelize. There are many thorns in the flesh for those praying and counseling in front of abortuaries, not least of which is not being able to reach each woman coming to kill her child with our message of life and hope, and save her child from the abortionist’s knife, and save her from the dark journey of guilt that she will travel for the remainder of her life. Being cursed at, threatened, and sometime spit on and assaulted by those from our “own country” who do not want to be reminded of the evil that they are about to do. Being questioned and falsely accused for the umpteenth time by police who are called out on yet another false report by the abortionists. Explaining to FBI agents that handling brochures to abortion seekers is not illegally blocking access to an abortuary, even if a pro-abort, anti-Catholic attorney general declares it to be so. Watching pro-life volunteers, able bodied and disabled ordered off public sidewalks and forced to stand in the street because government officials and politicians, including Catholic politicians, conspire with the abortionists to silence the truth. But the Lord has told us the truth, just as he told Paul. “My grace is sufficient for you. For my power is made perfect in weakness.” Paul accepted this paradoxical answer, even if it was painful. Do we?